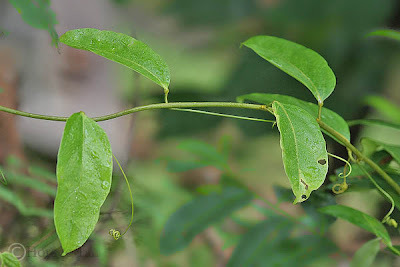 The local host plant is a member of the Passifloraceae family. 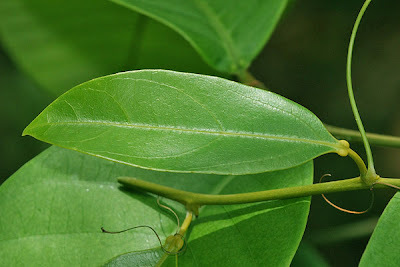 Also known as Singapore Adenia, it is a botanical variety of Adenia macrophylla which occurs only in Johor and Singapore. One prominent feature of this tendrillate climber is the pair of spatulate glands at the leaf blade base. 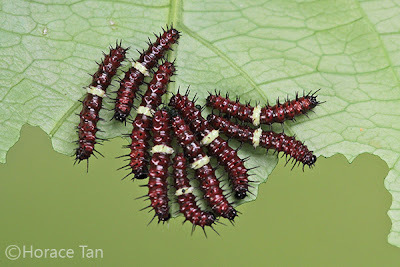 Caterpillars of the Malay Lacewing feed on the young shoots and immature leaves of the host plant. The Malay Lacewing caterpillars are gregarious throughout all five instars, often eating, resting and moulting together in groups. The eggs of the Malay Lacewing are laid in a moderately large cluster on the underside of a young leaf, on a young stem or even a tendril. Each egg is pale yellow, barrel-shapped with a ribbed surface. 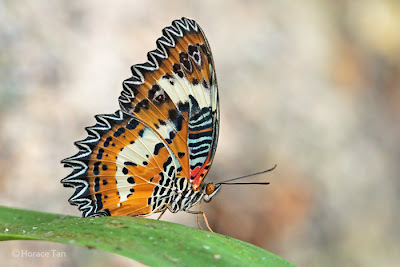 Height: ~1.3mm, diameter of cross section: ~1mm. 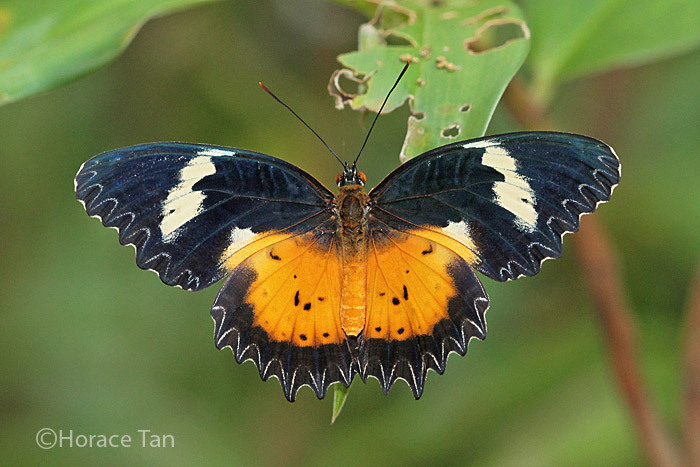 A female Malay Lacewing flying near an ovipositing site. 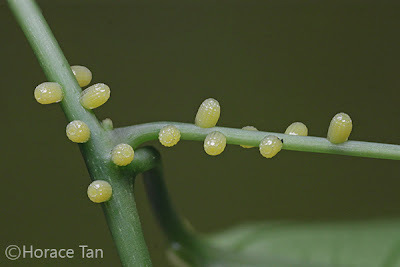 A cluster of fresh eggs of Malay Lacewing laid on a young shoot of the host plant. 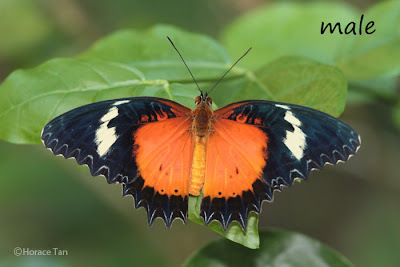 Each egg takes about 5-6 days to mature. 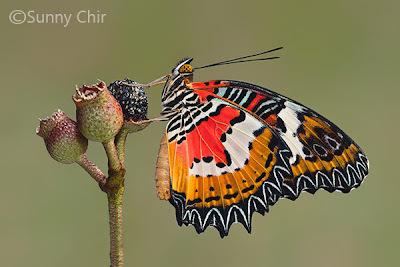 The young caterpillar nibble away sufficiently large portion of the egg shell to emerge, and does not bother to eat the remnant of the egg shell. The newly hatched has a cylindrical body in yellowish brown, and an initial body length of about 3mm. 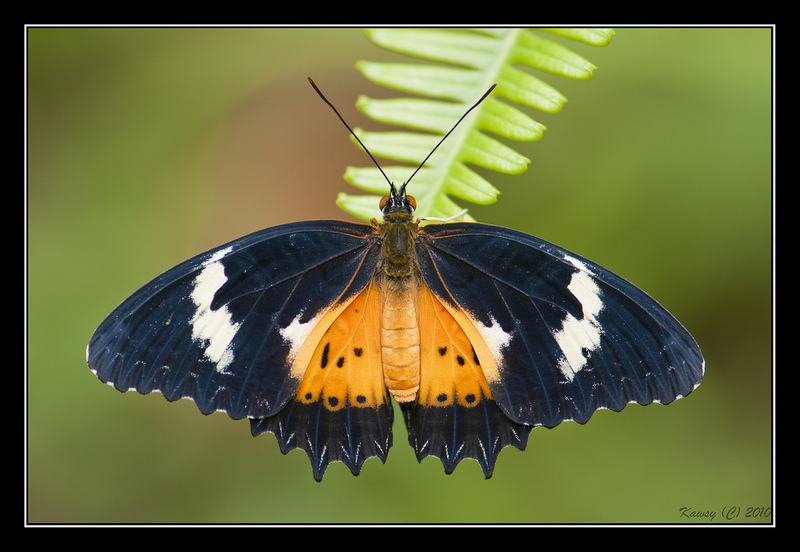 The body is covered in a grid of dark tubercles, each with a single long seta. The head is black and there is a pair of short black spines on the first thoracic segment. When feeding, the young caterpillar either skims the lamina on a young leaf or nibbles away at the tip of a young stem. 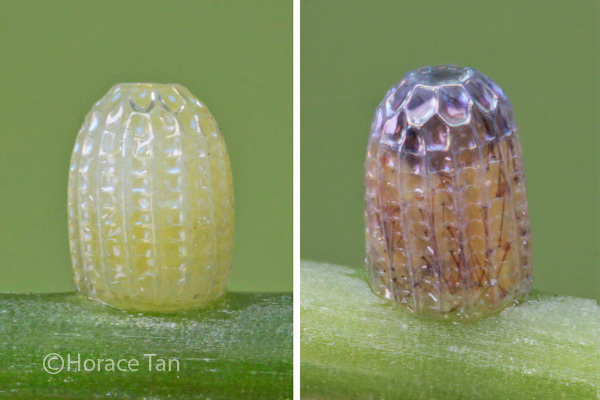 Close up views of an egg of the Malay Lacewing. Left: 2-day old; Right: mature egg with head capsule and setae discernible. 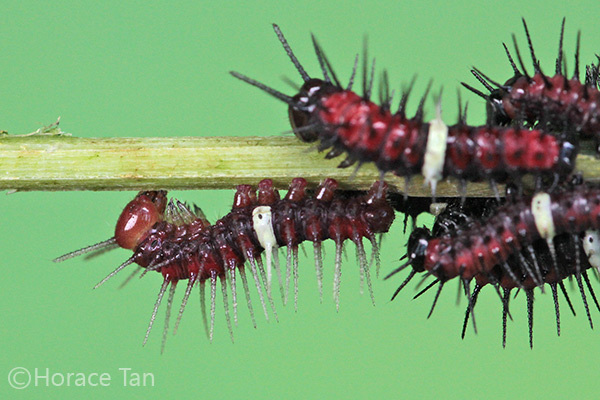 As the 1st instar caterpillar grows, the body color darkens to orange and finally to wine-red. A faint white saddle mark appears on the 4th abdominal segment initially, but turns prominently white when the caterpillar lies dormant to moult. 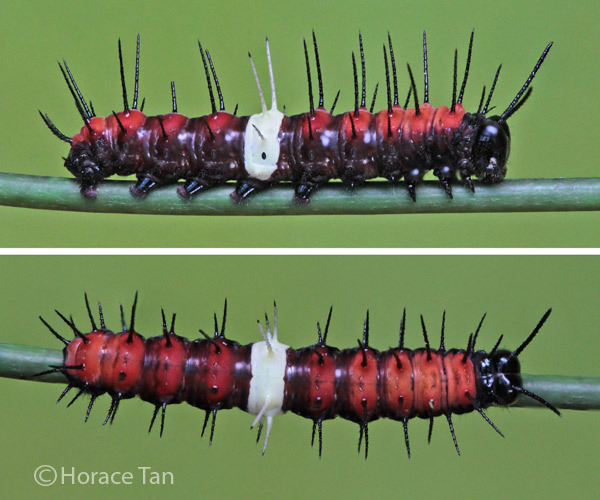 After 2.5-3 days in the 1st instar and reaching a length of about 6-7mm, the caterpillar moults to the next instar. 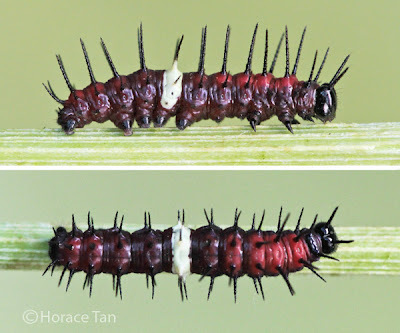 The 2nd instar caterpillar has a dark wine-red body colour, and the rows of tubercles in the 1st instar are replaced by 6 longitudinal rows of dark fine-pointed spines, 3 to each side of the body. The spines in uppermost two rows are the longest. A pair of short and black coronal spine appears on the head. 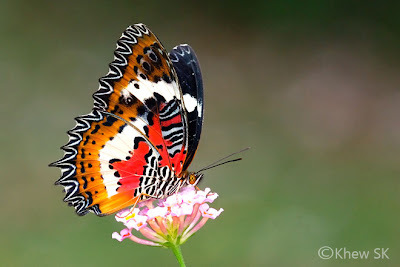 The white saddle is prominently marked. This instar lasts about 2-2.5 days with the body length reaching about 10-13mm before the next moult. 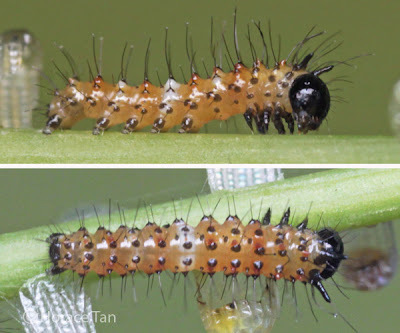 Two views of a 2nd instar caterpillar, early in this stage, length: 7.5mm. 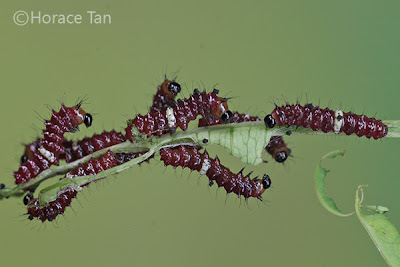 A group of 2nd instar caterpillars, length: 11-13mm. 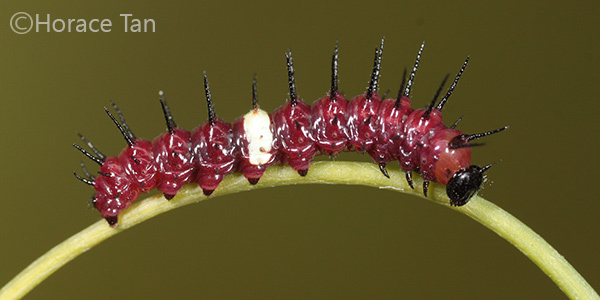 A late 2nd instar caterpillar, dormant prior to its moult, length: 12.5mm. The 3rd instar does not bring along any drastic change in physical appearance except for proportionately longer coronal spines (now about the same length as the height of the head capsule), and the larger and more distinct white saddle mark. 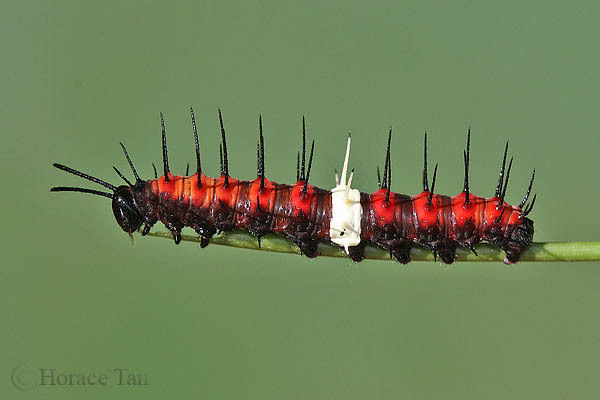 This instar takes 2-3 days to complete with body length reaching about 16-18mm. Two views of a 3rd instar caterpillar, early in this stage, length: 13mm. Two views of a 3rd instar caterpillar, late in this stage, length: 18mm. 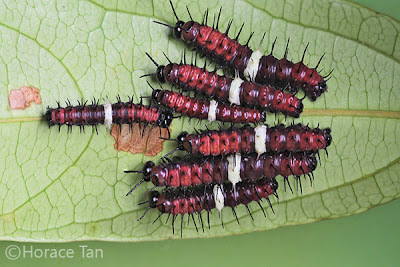 A group of 3rd instar caterpillars of the Malay Lacewing. The coronal spines in the 4th instar caterpillar are again longer proportionately with the length of each spine about equal to the 1.5x height of the head capsule. The spines in the white body segment are now coloured entirely white except for their pointed tips. The upper half of the body is bright wine red, while the lower half is dark red. 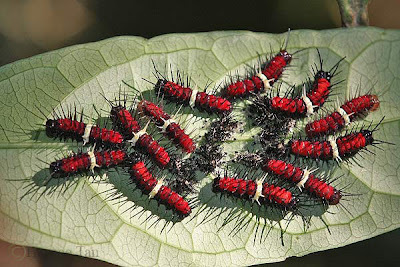 The 4th instar lasts about 3 days with body length reaching about 25-27mm. A group of 4th instar caterpillars, early in this stage. A group of 4th instar caterpillars, late in this stage, dormant prior to their moult. The next moult brings the caterpillar to its 5th and final instar. 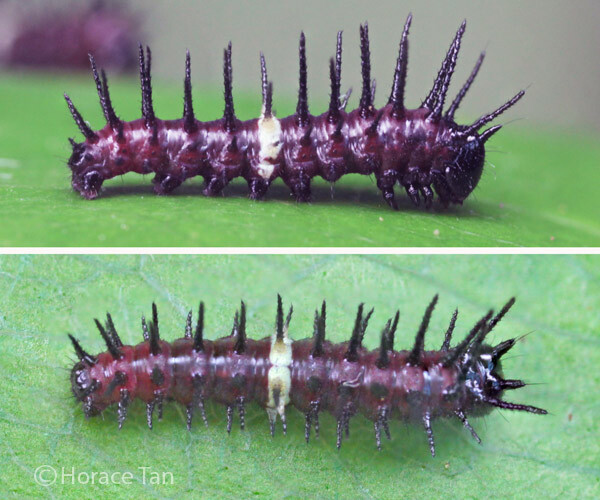 The caterpillar retains the same body features as in the 4th instar. 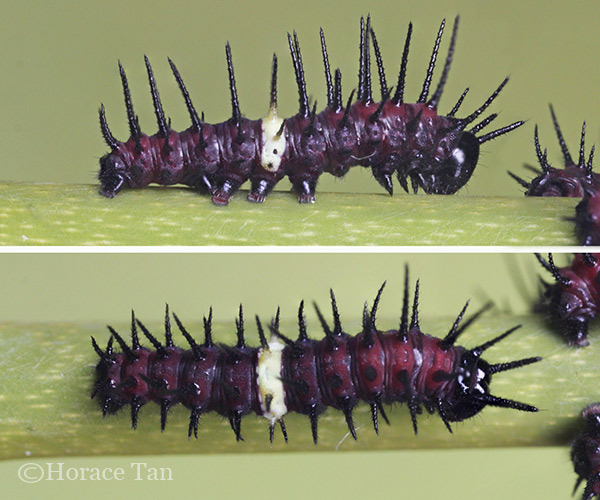 Now the coronal spines are about 2x the height of the head capsule. 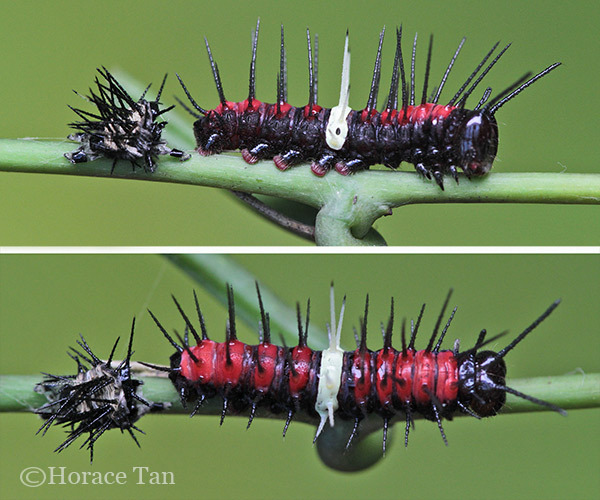 This instar lasts for 4 days with the body length reaching up to 35-40mm. 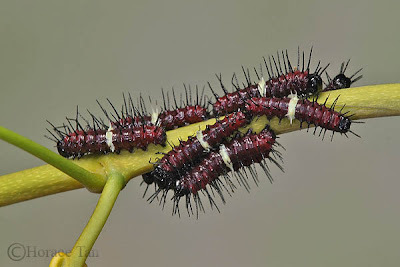 A group of early 5th instar caterpillars. A 5th instar caterpillar, length: 37mm. 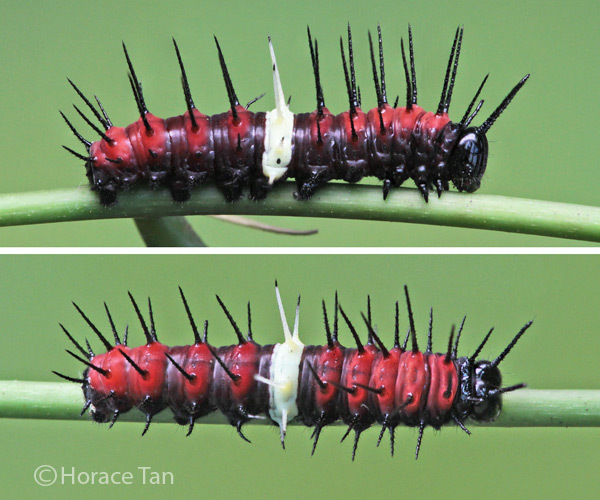 Toward the end of 5th instar, the caterpillar stops feeding and moves around in search of a pupation site. Finally the caterpillar finds a spot on the underside of a leaf, stalk or stem to spin a silk pad to which it secures itself with the claspers at its posterior end. 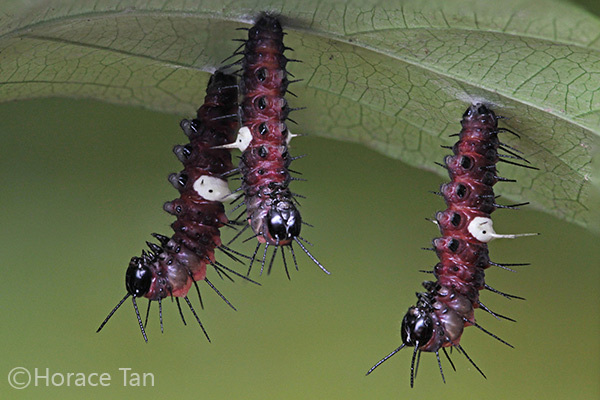 Now the caterpillar is an immobile pre-pupa, hanging vertically from this pupation site. At times, several of the pre-pupae could be found in close proximity. 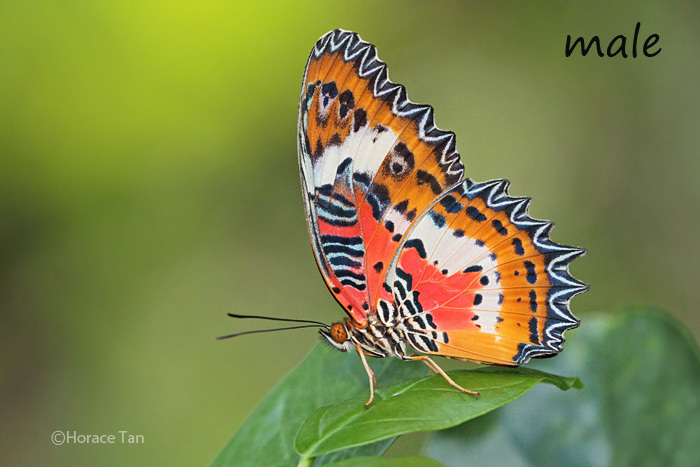 The pupation site needs not be on the host plant itself. 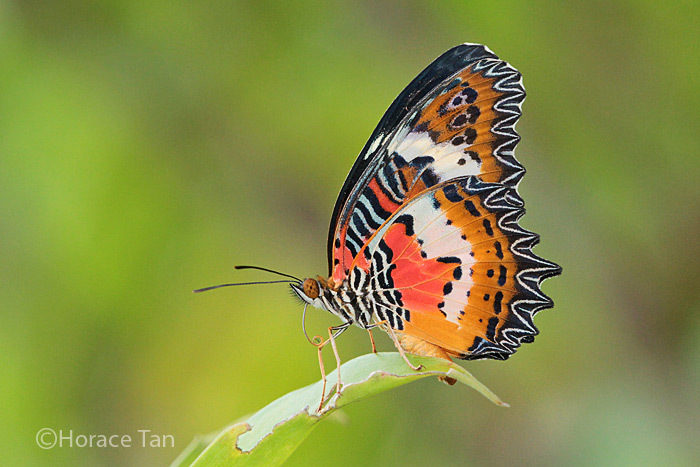 In the wild, Malay Lacewing pupae have been found on other plants several metres from the host plant. 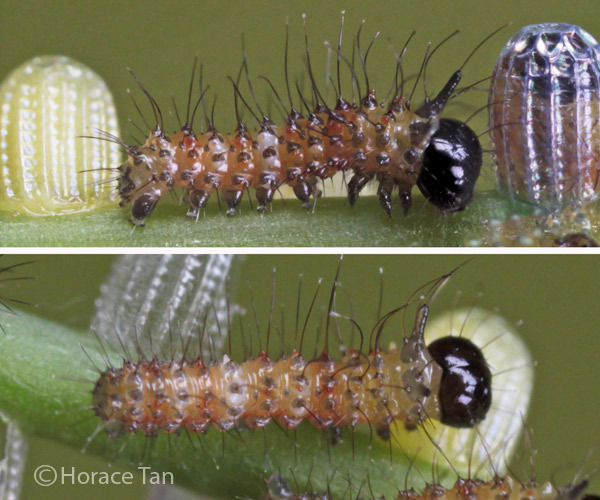 Three pre-pupatory larvae of the Malay Lacewing found on the underside of a leaf. 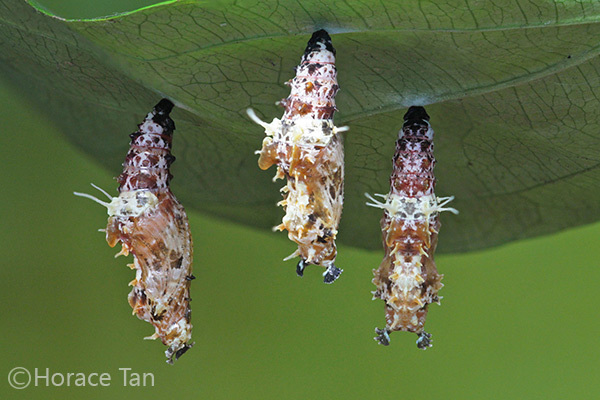 Three pupae of the Malay Lacewing, from the three pre-pupae shown in the picture above. 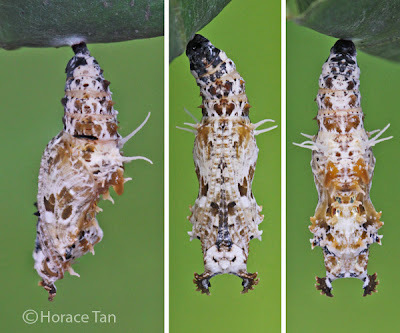 A Malay Lacewing caterpillar moults to its pupal stage. Pupation takes place a day later. 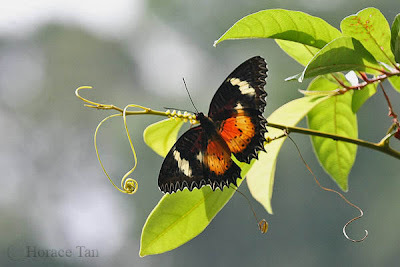 The pupa hangs vertically. It has two pairs of slender pointed white processes at the middle of its body and a number of less prominent dorsolateral processes. 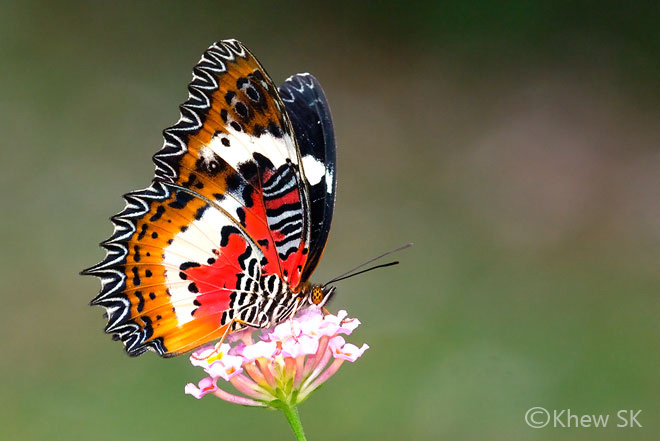 A pair of black foliaceous processes adorn the head. 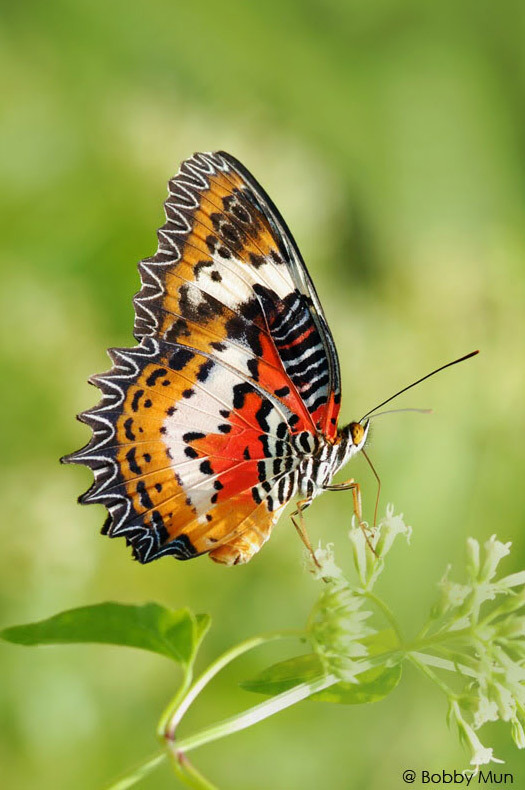 Body color is pale brown mottled with white and black patches, and several dorsal spots of bright gold. Length of pupae: 26-29mm. Three views of a pupa of the Malay Lacewing. 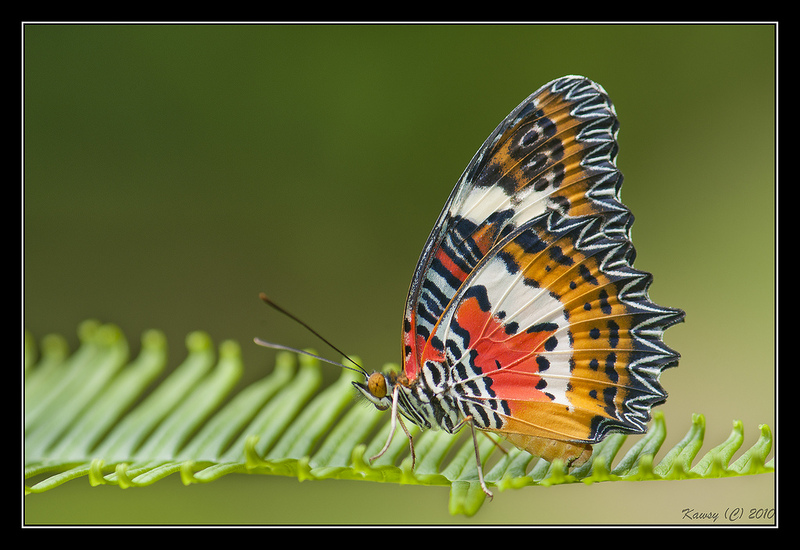 Left: lateral view; Middle: ventral view; Right: dorsal view. 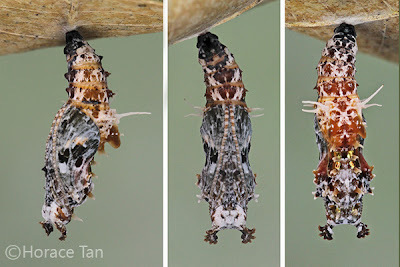 After 6-7 days of development, the pupa becomes darkened. The next day the adult butterfly emerges to kick-start the around round of the life cycles for this species. Three views of a mature pupa of the Malay Lacewing. 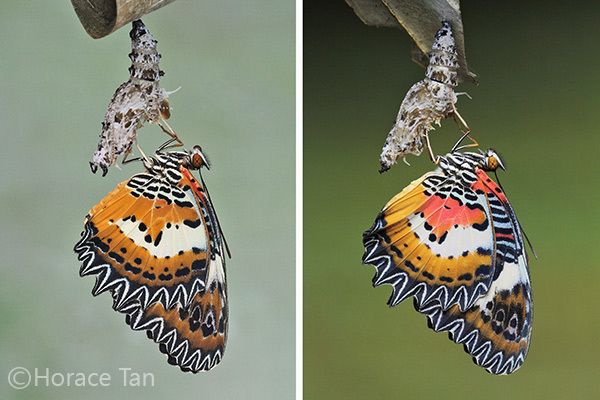 A Malay Lacewing emerges from its pupal case. Newly eclosed Malay Lacewing clinging on to its pupal case. 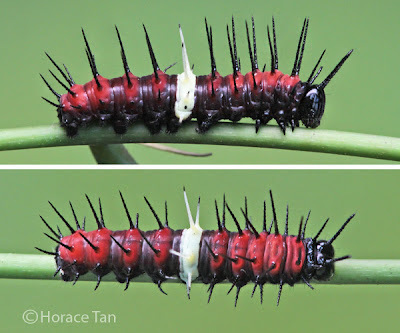 Left: female; Right: male. 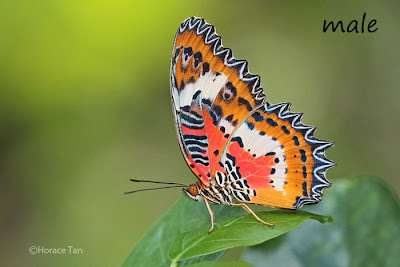 Text by Horace Tan, Photos by Bobby Mun, Nelson Ong, Sunny Chir, Khew SK and Horace Tan.